Whether you spend a lot of time cooking from scratch or are more of a convenience eater, kitchens can quickly become one of the most wasteful areas of the home. This article doesn’t cover how to reduce food waste and shopping without plastic, as these are on other articles on our blog. It does, however, cover all the other products within the kitchen which I have changed since I started my journey towards a zero waste life. Kitchen paper is often wrapped in plastic wrap, and when used for mopping up grease and dirt, it's thrown into the rubbish ending up on the landfill. Use more tea towels. Buy more from a charity shop, or cut up old linen or cotton bed sheets. We go through fresh tea towels quickly for cleaning up what I would've used a paper towel for before. If you know you won’t be able to stop using paper towels or are worried about increasing your water consumption through washing more tea towels, opt for an environmentally friendly paper option. Who Gives a Crap sell sustainable paper products from kitchen paper to toilet roll. All the packaging is recyclable and the used paper towels can be put straight onto the compost heap. These products are either non-recyclable, or hardly ever recycled, due to the fact that they would need the food scraps washed off them before recycling. Certain councils also refuse to take this waste from kerbside recycle points. Greaseproof paper/baking paper – I purchased some silicone baking mats a year ago and they've served me well so far. I have really old baking trays, which I am weary of putting food straight onto, so these baking mats are a good solution. Now I've become more conscious of plastics (even if it's a purchase to be used for a long while) I think I would've opted for a cast iron baking tray. 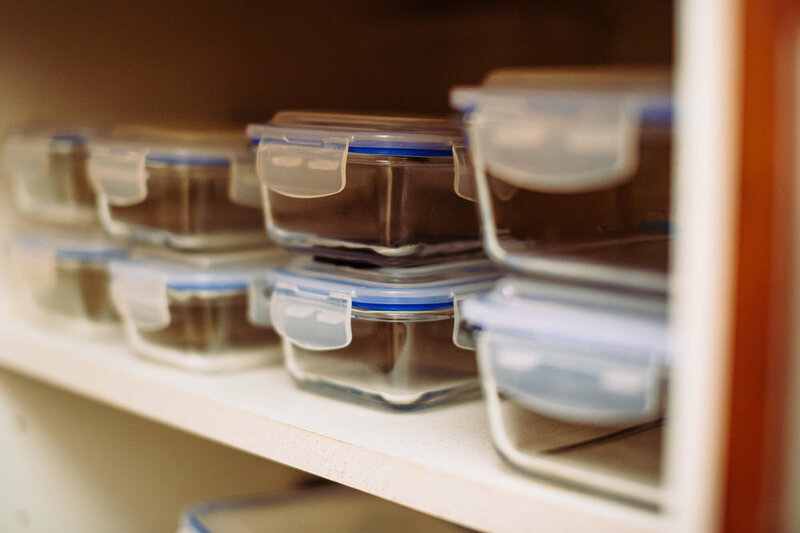 Clingfilm – A good old Tupperware can do just as good (or better!) than the wasteful Clingfilm can. If you think Tupperware will be too bulky, take a look at beeswax wraps, or soya wraps if you avoid animal products. They can be used to wrap sandwiches and products you might keep in the fridge. Tin foil – Likewise with cling film, opt for Tupperware, or reusable wraps were possible. If using tin foil for cooking, try and use a casserole dish with a lid or hunt around charity shops for one. If you’re cooking something like sausages, you could use the silicone mats or a cast iron baking tray. Chemicals! They’re not good for us,and they are certainly not good for the marine life who end up surrounded by this polluted water. Ecover does a range of differently scented washing up liquids and detergents with none of the harsh chemicals in them. I'm then able to refill my bottles at the health food shop Indigo, in Moseley, Birmingham. I've found that they work best with a full sink of very hot water and a stiff scrubbing brush/pad. I've also used castile soap and baking soda, which I now only use for really stubborn stains rather than every day washing up. They're often hard or impossible to recycle and will be thrown into the landfill. Make your own – Washing up scourers can be made out of plastic wrap found around certain foods or crotched from old yarn. Buy a compostable brush – I purchased one of these two months ago and am still using the same brush head. It's a wooden base with plant fiber bristles, so it will fully bio-degrade at the end of its life. Compost the peels and pour the infused vinegar into a spray bottle. Surface cleaner has the issue as the washing up liquid and detergent; so many chemicals! I don’t like using things around my kitchen which are too harsh, as there are perfectly good and less abrasive, natural cleaners. Baking soda – If there are stubborn stains on the kitchen hob, for instance, I would use a small brush (an old toothbrush works well) and scrub some baking soda and a little water into the stain, leave for a few minutes, and tah-da! The stain will be easy to remove. I use this as an all surface cleaner (including mopping the floor) by dissolving one tbsp. of baking soda in some hot water and using a cloth to wipe down the surfaces. Honestly, it makes them sparkle! White vinegar – I’ve filled an old spray bottle with white vinegar which I spray onto surfaces, leave for about a minute and wipe off. You can infuse your vinegar with spices or orange peels to prevent your house smelling like the local chippy. All of these surface cleaning techniques can also be used to clean the bathroom and they'll save you money too. Bonus! The desire to always buy MORE! Anna and I still fall for this niggly feeling every now and again. That urge to buy what we want, rather than what we need. I'm blessed to be getting to the point where there is hardly anything in my kitchen (and house for that matter) that I need. Every now and then, I still listen to that feeling to buy what I want, which means I might end up with useless kitchen gadgets built with planned obsolesce ending up on a landfill. Make do with what you’ve got – This includes ingredients and kitchen gadgets. I’m always googling kitchen alternatives if I haven’t got the exact product that is needed. Some things are really easy to substitute and if I need a certain kitchen gadget, I can usually find a way around it. We do still buy things though. Typically, if we see something we want (say, a new kitchen appliance) we'd put a date in our diary for about a month ahead and see if we still want that product, or whether it was just an impulse. If we thought about it loads, and really think it could make a positive impact on us, we'll buy it. And if the item can be found on a second-hand website- even better! At least it's had one life already.